This book is the perfect companion for anyone beginning their GIS adventure and can even teach a trick or two to those seasoned professionals. I remember back to my GIS postgraduate course and making maps for the first time. I always thought I had an element of artistic flair from my days in national school art class and I was none the wiser about my map’s lack of, well, everything, after graduating. Okay, I wasn’t placing ridiculously oversized north-arrows or scale bars that were of odd measurements and using psychedelic colouring schemes but I had no idea how far off I was from making publishing-worthy mapping outputs. Luckily my first and second jobs involved mass outputs of paper maps and it was here that I initially learned about many of the aspects of this book such as the placement and size of elements and the use of white space. One great aspect about this book is that although it is an ESRI Press publication their products are not shoved down your throat. ArcGIS gets a mention every so often but this book is far from a tutorial style walk-through and airs more on the side of theory and practicality. The design processes discussed can be performed in the majority of GIS software and the option of performing edits in graphic design packages are also mentioned quite frequently. The first chapter emphasises designing a map for it’s intended purpose and audience through the visual hierarchy of data and by planning your layout, balancing empty spaces and the refinement process through experimentation. Choosing the right projection can also play a key role to how the data is displayed and how it visually impacts the final product. Basemaps are an essential part of the design process and getting the background information right can be the difference between a good map and a great map. Chapter 2 cycles through many types of basemaps and how you can control their impact on the map through raster and vector based background information and how you can keep the important information prominent. Chapter 3 puts forward the notion of self explanatory maps. Whoever is reading the map should not have to seek the attention of the author to explain what is going on. This is achieved through the legend, wording the title appropriately, utilising supportive text and placing it in context, and making use of mapping elements such as the north-arrow, scale-bar, and graticules and their position in the visual hierarchy. Maps are everywhere these days, there are interactive webmaps, static webmaps as images on a website, maps embedded in documents such as PDF, maps displayed on TV, and believe it or not maps still get printed in paper format. With all the output and display options available you must make sure that your map can accommodate each medium that it will be presented in. Chapter 4 explores the common pitfalls with exporting especially with handling transparency and finishes up with copyrights and attributing the source of the data to avoid infringement. The fifth chapter addresses an area that I have had problems with in the past and that is choosing the correct font(s) for the map. This chapter alone made the purchase of the book worthwhile. From fonts to labelling the book flows naturally and we all know how cumbersome labelling can be when trying to finalise a map. Labels can often rank higher in the visual hierarchy than intended or wanted. Clear labelling helps your audience correctly interpret the mapped data. Size, weight, case, and lightness are just some of the criteria used to communicate differences in importance. With labelling being such a time-intensive part of map creation, knowledge of labelling conventions will improve efficiency in quality map production. Chapter 7 gets to the nuts and bolts of what I’m sure most of you thought this book would be all about, colours. I have previously sat through a whole university module for digital media where RGB and CMYK colour played a role but this chapter really simplifies it all before progressing to chapter 8 and discussing the prevalent role of colour choices for features on a map. Colours are intended to make your maps easier to read by ensuring that your map matches the logic of your data. The author discusses several colour schemes, sequential, diverging, qualitative, bivariate (sequential, diverging, qualitative) and then fine tuning the colour selection with custom colour ramps and making maps more accessible for people who are colour-blind. The final chapter mainly builds upon Chapter 8 but also draws from several other chapters. The main focus of the chapter is customising symbols for ordered data and symbolising categorised data into qualitative classes. Point, line and area symbols are discussed using a variety of symbolising methods such as proportion, graduated, size/width, shape, angle and patterns. The author neatly creates a table for eight visual variables for points, lines and areas giving twenty-four basic ways to vary symbols for representing your mapped data. To build upon Chapter 8 symbols for multivariate, overlaid, bivariate, quantitative and qualitative data are explored relating to sequential and diverging schemes. The Appendix provides us with information on the ColorBrewer website and there are pages of colour palettes for reference. Overall Verdict: I wish I had this book in my possession when I first enrolled for a career in GIS. Even after years of producing and plotting hundreds of maps this book has enforced some new and reinforced some old quality controls required to produce the best possible map for the intended audience. It’s an easy read with chapters short but very informative and to the point. I will be keeping it handy as a reference especially for the chapters relating to fonts, labelling, and colours. If you are a seasoned GIS user and feel that your maps are still lacking that final bit of quality this book is a good place to get you over that final hurdle. I am often guilty of rushing a map to final product and this book really enforces basic standards for efficient quality output. 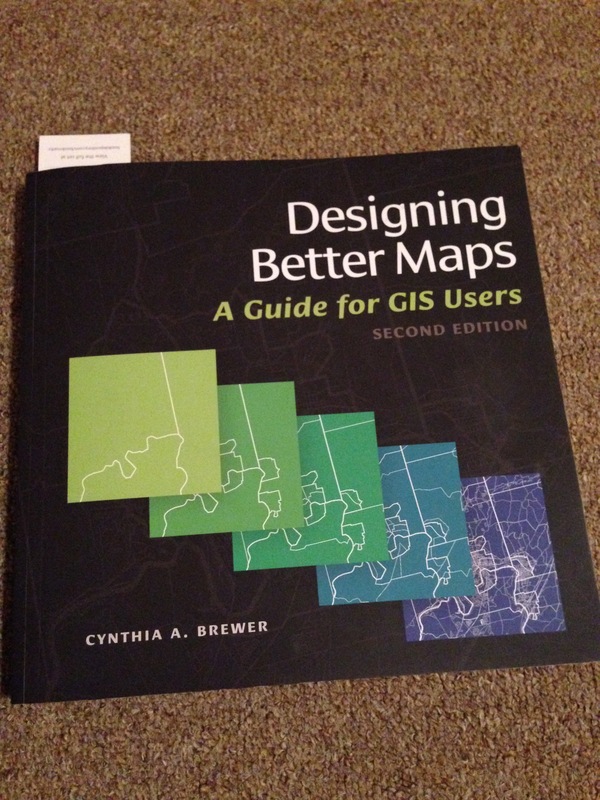 This entry was posted in Book Review, GIS and tagged basemaps, Book Review, Brewer, colours, Designing Better Maps, ESRI Press, fonts, Labelling, symbols, visual hierarchy by clubdebambos. Bookmark the permalink.